The most popular beach for surfing, body boarding, sundowners and sunbathing. 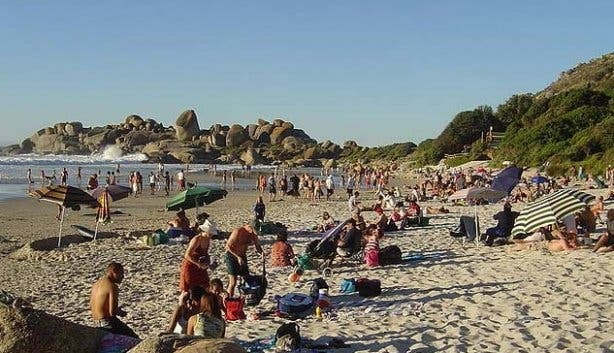 Further along the coastline of Cape Town, just after Camps Bay and Bakoven, you will find one of the most beautiful beaches in Cape Town: Llandudno Beach. This laid- back beach is popular for surfing, body boarding, sunbathing and sundowners. The sunsets at Llandudno are stunning. The charm of Llandudno beach lies in its remote location. The beach is quieter than Camps Bay and Clifton. There are no shops, restaurants and bars nearby, but a few vendors are usually walking around: Selling snacks, drinks and ice creams. Deck chairs and umbrellas are available for daily rental. Activities on Llandudno beach: Body boarding, sheltered sunbathing, sunset picnics, braaing, whale watching in season (September - December), surfing, swimming, bodyboarding and snorkeling. Also it is a slightly quieter beach in Cape Town where the kids can play all day. Subscribe to our free newsletter for more information on activities in and around Cape Town and the rest of South Africa; travel tips; accommodation specials; car hire and much more.